With more funding, the B'N Fit program at the Bronx's PS 8 will expand and work to incorporate the whole family. On a recent Tuesday afternoon, about a dozen teenagers darted back and forth across the gymnasium at PS 8, their sneakers squeaking on the polished floors. Running drills were followed by several minutes of jumping jacks, then a game of basketball. Despite what looked like rigorous exercise, the kids were joking and smiling. The teens are part of “B’N Fit,” a year-round intensive fitness program run by Montefiore Medical Center and the Mosholu Montefiore Community Center that aims to help adolescents lose weight and embrace a healthy lifestyle. This month, the program scored $20,000 from the Coca-Cola Foundation to expand its service — part of a $300,000 pot of funds that the beverage company gave out to organizations this year in the form of “Healthy Active Living” grants. “This program is really a program that combines medical expertise with community service,” said B’N Fit Director Dr. Jessica Rieder, at a check presentation ceremony on Nov. 23. 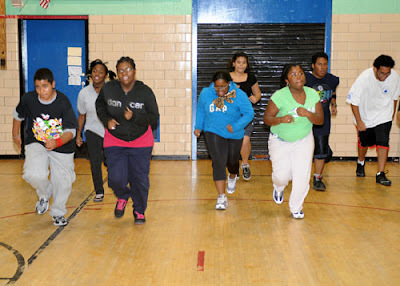 The B’N Fit after-school program currently serves young people between the ages of 12 and 21, and is made up of two parts: nutrition education classes followed by an hour-long exercise session. B’N Fit directors say they plan to use the grant money to expand the reach of the program, designing additional services to get the participants’ families more involved. The plan is to make the monthly “parents night” meeting a weekly occurrence, offer activities for younger siblings ages 5 and up, and offer childcare for children younger than that. B’N Fit is one of 16 programs across the country to win grants from the Coca-Cola Foundation this year. “Coca-Cola has always been committed to youth development, on a number of levels,” said spokeswoman Harriet Tolve, who said they received over 100 applications from New York organizations alone. Groups that had a family and community-oriented health angle were chosen over others, she said. It’s been a tough few years for Coca-Cola and other soda companies in New York City, as a health conscious Mayor Bloomberg and the Health Department have waged a campaign against the sugary drinks in an effort to fight the obesity epidemic. Bloomberg is currently looking into banning sugary drinks from being purchased using food stamps. Tolve was quick to point out that the Coca-Cola company produces more than just soda. The company is behind Dasani bottled water, for example. Ed. Note: This article appears in the latest edition of the Norwood News. To learn more about the program, or to see if your child is eligible to participate, call (718) 920-2232.